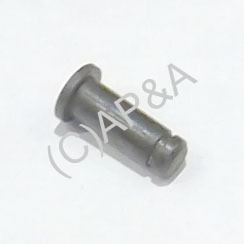 Shoulder stud used for standard side-by-side drop targets in some Bally games. Measures 9/16-inch overall length. Uses 1/4-inch e-clip (not included). Used with thin-top and wide-top Bally drop targets. Not for use with in-line drop targets- see note below. Fits through drop target and connecting arm and secures with e-clip. Can also be used to replace Bally # S-739-227 (stud that uses 2 e-clips), and Stern part # 2A-230 used with Stern drop target # 13-A. NOTE: Not for use with in-line drop targets- use S-458-32 for in-line target mounting.